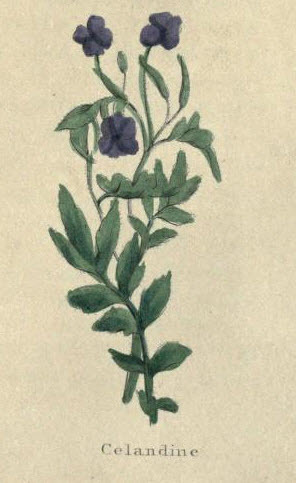 Chelidonium Majus. A common wild plant having large leaves, and yellow flowers. It grows nearly three feet high. The stalks are tender, round, green and naked, with thick joints. This plant, when broken in any part, emits a yellow juice, bitter in taste, and strong in scent. The leaves stand two at each joint; they are large, long, and deeply divided at the edges, and are of a yellowish green. The flowers produce small long pods, with blackish seed. They grow by old walls, hedges and way-sides, in untilled places, and in gardens. They flower all the Summer. It is a most valuable remedy for diseases of the eye, used as a docoction, or made into an ointment. The juice is the best way of administering it, it is an efficacious remedy for the jaundice, scurvy, and all obstructions of the liver and other viscera. The addition of a few aniseeds in making a decoction of it with wine, increases its efficacy in removing obstructions of the liver and gall. The juice applied to warts soon removes them, also ring-worms. The juice mixed with sulphur is a remedy for the itch. It has been given with great effect in scrofula. An ointment made of the roots and hog's lard is a good remedy for the piles. Boil them together.